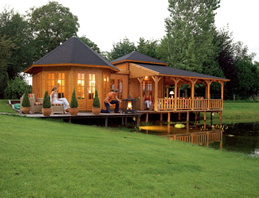 Many kinds of buildings and structures can be built in your garden without the need to apply for planning permission. 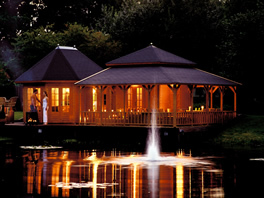 These can include sheds, garages, greenhouses/potting sheds, accommodation for pets and domestic animals, summer houses, swimming pools, ponds, sauna cabins, enclosures (including tennis courts) and many other kinds of structure. You want to put up a building or structure, which would be nearer to any highway than the nearest part of the ‘original house’, unless there would be at least 20 metres between the new building and any highway. The term ‘highway’ includes public roads, footpaths, bridleways and byways. More than half the area around the ‘original house’ would be covered by additions or other buildings. The building or structure is not to be used for domestic purposes, and is to be used instead, for example, for parking a commercial vehicle, running a business or storing goods in connection with a business. You want to put up a structure which is more than 3m high, or 4m if it has a ridged roof. 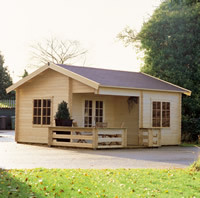 If your house is a listed building, you want to put up a structure with a volume of more than 10 cubic metres. In a terraced house or any house in a Conservation Area, National Park, an Area of Outstanding Natural Beauty or the Broads, the volume of the original would be increased by more than 10% or 50 cubic metres whichever is the greater. For any other kind of house, outside those areas, the volume of the original house would be increased by more than 15% or 70 cubic metres (whichever is the greater). In any case, the volume to the ‘original house’ would be increased by more than 115 cubic metres. Volume is calculated from external measurements. If an extension to your house comes within 5m of another building belonging to your, the volume of that building counts against the allowance for additions and extensions. Any building which has been added to your property and which is more than 10 cubic metres in volume and which is in 5m of your house is treated as an extension of the house and so reduces the allowance for further extensions without planning permission. If you are concerned about a legal problem involving planning you may get professional advice or ask your local Citizens Advice Bureau. The legal definition of a mobile home is the same as that for a caravan. Broadly speaking, it covers any structure designed or adapted for people to live in which is capable of being moved from one place to another (whether by being towed or by being transported on a motor vehicle or trailer) and any motor vehicle so designed or adapted. This does not include railway stock which is in use, nor tents. It does include twin units separately constructed and designed for assembly on site, provided that the twin unit is physically capable of being moved or transported on a motor vehicle or trailer). The twin unit must be no more than 60ft (18.288 metres) long, 20ft (6.096 metres) wide and the living accommodation no more than 10ft (3.096 metres) high. The question of whether any individual mobile home is within this definition can only be decided finally by a court. Anybody who is not sure whether the definition applies to his/her mobile home should consult his/her local authority or Citizens Advice Bureau or seek advice from a solicitor.